Being Frank: The Chris Sievey Story was one of our favourite screenings at the London Film Festival last year, and to say we’re ecstatic to be bringing Timperley’s most famous son to Herne Hill in May is the biggest understatement since we described Maid in Manhattan in the early 2000s as just “fairly terrible”. 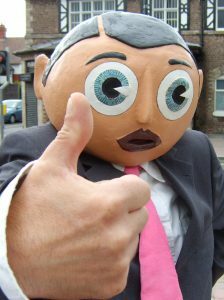 This is exactly the sort of doc we like to show at our little festival and we know you’ll love it… whether or not you’re familiar with Frank Sidebottom’s comedy, music or papier-mâché head. The world was introduced to Frank Sidebottom in 1984 on a 12-inch promotional record that came free with a ZX Spectrum computer game, and by the early 1990s he had established himself as one of the leading cultural figures in the Madchester scene and he was a regular on local and national TV (most famously with his ITV show “Frank Sidebottom’s Fantastic Shed Show”). But the man behind Frank Sidebottom was, well, not really that visible or that well known. Steve Sullivan’s film brings Chris Sievey, the man behind the mask, to life and tracks the development of his and his character’s career, punctuated by music, animation, painting, drawing, poetry, comedy, filmmaking and tour-guiding, that is simply too-bizarre-not-to-be-true. Featuring the talking heads of Johnny Vegas, Ross Noble, John Cooper Clarke and Mark Radcliffe the film gets us closer to Chris as well as giving us just a little insight into how you can chase success, even if it’s not easy, or quite what you had originally intended. Being Frank: The Chris Sievey Story dances its way to The Prince Regent on 5 May at 8:00pm. This is a great venue, however because of their super-comfy sofas space can be quite limited… so get there early to bag a good seat. Though if you choose to wear a Frank Sidebottom head we might ask you to sit towards the back so everyone can see the screen!